With a chef-crafted menu of gourmet Italian-style classics made with the finest seasonal, local ingredients, Bottled Blonde Pizzeria + Beer Garden is more than just a pretty face. So Valley diners will be delighted to sample the fresh new flavors now available at this popular restaurant and lounge. 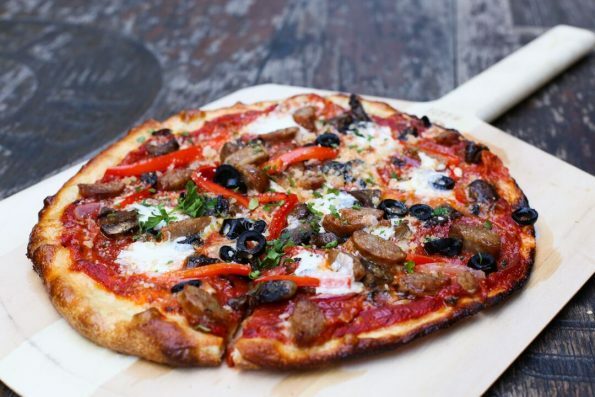 Served daily after 3 pm, Bottled Blonde’s dinner menu now features a plate-bending Supremo Pizza piled high with pepperoni, Italian sausage, four blend mushroom mix, fresh shaved red onions, green peppers, black olives and finished with house-made mozzarella. And back by popular demand, Pizza Fries are covered in shredded mozzarella and sliced pepperoni and served with our house marinara sauce. Cool down this summer with a fresh-picked Farmers Salad (romaine, kale and baby greens tossed in a light mustard seed vinaigrette, topped with feta cheese, avocado, shaved carrots, edamame, marinated tomatoes, marcona almonds and oven-dried cherries). Or enjoy a classic Caprese Chopped Salad (chopped baby greens and romaine tossed with white balsamic vinaigrette with grilled house croutons, marinated tomatoes, fresh house mozzarella and basil); or a Strawberry Bacon Kale Salad (hearty Tuscan kale with applewood bacon vinaigrette with feta cheese, toasted sliced almonds and sliced strawberries). But be sure to save some room for Bottled Blonde’s new Apple Pecan Bruschetta dessert, a decadent combination of apple & pecan sweet bread, sweet cannoli cheese, finished with warm, chunky apple chutney. Finally, wake up your weekends with two all-new Brunch treats: French Toast Waffles (house-made bread dipped in a cinnamon sugar batter and pressed into waffles, finished with a fresh blueberry and maple syrup reduction.) The Egg White Wrap (egg whites cooked with roasted red peppers, hand pulled chicken breast, avocado and shredded mozzarella, wrapped in a spinach tortilla and served with fresh Idaho hash browns) is a welcome healthy start to your day. Best of all, pair your meal with Bottled Blonde’s extensive list of handcrafted cocktails, worldly wines and craft beers.